One WakeMeUp! license costs $19.95 (approx. 13.5 euro) and is valid for ALL versions that will ever be released. Want to translate WakeMeUp! into your native language? Click here to know more. One WakeMeUp! license key costs $19.95 (approx. 15 euro). 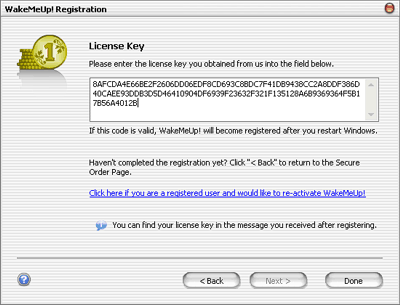 A single license key is valid for all users of the computer. In "Get It" section of this site you can download a fully functional 15-day trial(evaluation) version of WakeMeUp! When the trial period is over, please decide if you need WakeMeUp! or not. The following step-by-step guide describes in details the process of purchase. Please note: a license key is valid for ALL versions that will ever be released. Start WakeMeUp!, then choose ? | Buy WakeMeUp! in main menu. WakeMeUp! Registration Wizard will appear. 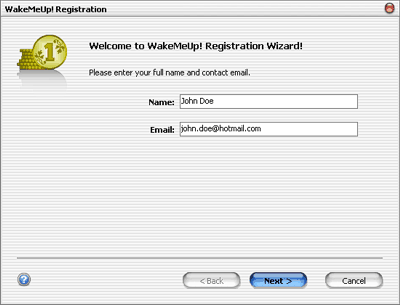 If your evaluation period is over this wizard is displayed automatically every time you start WakeMeUp! Please enter your full name and contact email on its first page and press Next > when done. The First Step. Personal information. Now everything is ready for opening Share-It! Secure Order Page. Click the appropriate link in wizard's window to open the order page in your browser. You can copy this link to clipboard if you'd like to complete the registration on another PC or open the page in non-default browser. Fill in the order form in your browser. Close the wizard by clicking Done at the bottom of the window. Please read this FAQ to know more. The Second Step. Secure order page link. Usually it takes less than an hour for a license key to be delivered. Please open the message you received from us and copy your license key from it. Start WakeMeUp! If your evaluation period is over, the wizard's window displaying the License Key page will appear, otherwise you'll need to click ? | Buy WakeMeUp! in main menu to open it. Paste the key into appropriate text box and press Done. WakeMeUp! will inform you that it will become registered only after system restart. Please reboot your PC and make sure there is a Registered version label in the About window (you can access it by clicking ? | About in WakeMeUp! main menu). The Third Step. License key.